Find everything you need for a great party in Dunedin. We can help you plan and book your party or a weekend get away. 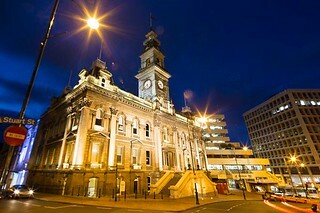 Dunedin is the second largest city in the south island of New Zealand. It is a proud city of its scots heritage. Dunedin was built in a time before the car was king, when ships and railways were used for transportation. The city is surrounded by steep hillsides. There are many steep streets inside the city and Baldwin street is claimed to be the steepest street in the southern hemisphere. You can get there by car, by train or by plane. To move in the city the local bus service can be used, which is not very attractive but cheap in fairs or you can rent a bicycle. The summers are relatively mild in this area, while in winters the days are pretty cold. The snowfall may continue for several days and the entire city closes down once or twice a year due to snowfall settling. The most famous attraction of Dunedin is its University of Otago, established in 1869. It is the oldest university of New Zealand. The students of Otago University make up over the tenth of the population of the city, and that is why the city is significantly quieter during the University summer holiday (approximately November to February). The Otago Peninsula is a long, hilly indented finger of land that forms the easternmost part of Dunedin, New Zealand. The visit to Otago Peninsula is incomplete without taking in the outstanding natural beauty and wild life of Otago Peninsula and The Royal Albatross Centre. The Royal Albatross Centre provides wildlife and cultural tours of Taiaroa the historic Fort Taiaroa and see the Little Blue Penguins colony at Pilots Beach. People from all around the world come here for spectacular views on the Otago Peninsula and together with its 20 km long harbour which is the home of magnificent world famous wildlife. A beautiful place to visit is Boulder beach, situated on the pacific side of Otago Peninsula and can be accessed by a number a walking tracks. For the people of interest another place to visit is Toitu Otago Settlers Museum. It was opened in 1908 and shows the traces of lives of the settlers- indigenous Māori, the early Chinese, and the following waves of migrant groups – and their technological innovation, art, fashion, domestic life and transport. Dunedin Chinese Garden is sited next to the Otago Settlers Museum and it is worth strolling in. The Garden was pre-fabricated and assembled in Shanghai on a site identical in size and shape to that in Dunedin, then dismantled and transported here where it was reconstructed by artisans and supervisors from Shanghai. Dunedin Botanic Garden is stunning as well and worth a walk around to check out the beautiful plants, flowers and lakes. Knox Church Dunedin is city's largest church of any denomination and a notable building in the city. Mayfair theatre Dunedin is famous for its live concerts, Operas and other events like exhibitions and seminars. The Auditorium has the capacity of 400 people and is a good place to visit for art lovers. Forsyth Barr Stadium A futuristic rugby and soccer stadium, it is fully enclosed with a grass surface—the only such stadium in the world. (The roof is transparent, allowing grass to grow). Home to the almighty highlanders if you are into Super 15.